WholeSoy Giveaway & Tropical Mango Banana Smoothie Recipe! 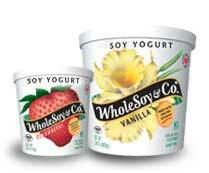 If you guys remember my Key-Lime-Vegan-Yogurt-Off, you know that I am a fan of WholeSoy. There are so many things you can do with this soy yogurt! Smoothies, froyo, yogurt parfaits, you can add fruit to them, really whatever you like. WholeSoy has been generous enough to send me some coupons and I am happy to announce that I have tried probably every single flavor they make. I enjoyed all the flavors like, strawberry banana, apricot mango, and lemon. Actually, the lemon was so good, I couldn't decide whether I liked the lemon or the lime better. The refreshing citrus flavor was very nice. I decided to have a GIVEAWAY with some of the coupons WholeSoy sent to me! I like to share these things with my readers. I really appreciate all my readers for your support. I believe in sharing good fortune with my friends, so since I'm fortunate enough to sometimes get coupons here and there from companies, I wouldn't feel right not sharing the love. My readers deserve to try this stuff too! So I am giving a 24oz tub of this stuff away, plus some extra bonus coupons to go with it, to one lucky reader! WholeSoy Coupon Prize Pack containing: (1) coupon for FREE 24oz tub, (3) coupons for $1.00 off any 24oz tub, and (1) $.25 off coupon on any 6oz cup! subscriber AND leaving a comment below telling me why you think you should win! You can enter the Twitter-way: Follow @theDirtyVegan AND mention/ RT about the contest! You can enter the Facebook-way: "Like" The Dirty Vegan fan-page AND leave a comment on my wall telling me why you think you should win! BONUS ENTRIES: each "way" you enter, gives you that amount of contest entries per day. Maximum amount of entries is 3 per day, via the Blog-way, Twitter-way, and Facebook-way. DEADLINE TO ENTER: Entries must be received by Thursday, March 31st at 9:00 PM EST. WINNER WILL BE CHOSEN AND ANNOUNCED ON FRIDAY, APRIL 1st! *by entering you are agreeing that we can announce your name if you win *the Dirty Vegan reserves the right to change the prize in the unlikely event that the prize is no longer available - Good luck! Great vegan alternative to egg salad! Mix ingredients together in a large bowl. Serve over toasted bread, in sandwiches or wraps, over greens or add in veggie salads, or eat it just as it is! Enjoy! In your large saucepan, heat olive oil on medium heat. Sweat garlic and onion until aromas are released, then add carrots and cook for a few more minutes. Then add in the rest of the ingredients (just not the pasta yet), bring to a boil. Then simmer on low for 30- 60 minutes. In the last 15 minutes, add the fusilli pasta and bring up heat just a tad, if necessary. Check to be sure the pasta is al dente before removing from heat. Enjoy! Make Everyday a Dirty Day...Start with Breakfast! There is no need for any animals to be McMurdered...make these for your fast-food loving pals and everyone will want to be Dirty Vegans! Heat the buttery spread in a fry pan on medium heat. Add tofu and seasonings, cook for about 2- 3 minutes. Add in chopped veggie sausage. Cook until nice and hot and combined. 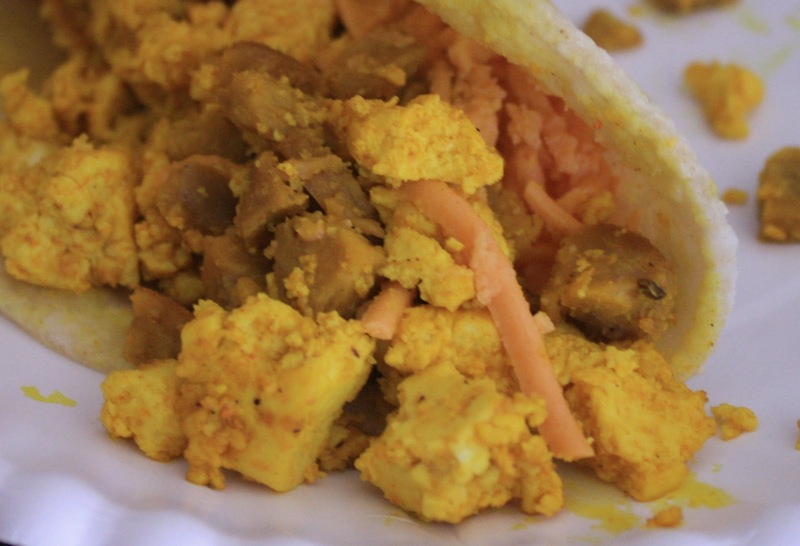 Warm your tortilla and place the cheddar shreds on it. Place you hot mixture on top of the cheeze and it will get all melty. Roll up tortilla in your desired manner. Eat with hot or picante sauce, if you like. Enjoy! This recipe makes 1 burrito, if you would like to make more...double, triple, quadruple, so on! Enjoy your Dirty breakfast! And here is a link to PETA's McCruelty campaign - "I'm hatin' it"! Spring is a wonderful time and the days feel bright and summery. We spend a lot of time outside, but the chill is still lingering. We crave fresh foods, but still get a little cold in our bones. 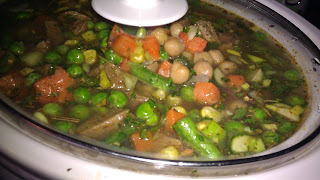 I hope this light stew recipe gives you the freshness you crave, but also warms you up and keeps you cozy. This picture was taken just after I put this together and it already looks delicious! Place all ingredients in crockpot and cook on Low for 6- 8 hours, or on High for 3- 4 hours. Serve with crusty bread or with my Olive Oil Biscuits. Enjoy! Meatout 2011 on March 20th! And in Honor of This, Crispy Rice Marshmallow Treats! 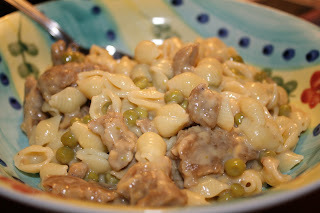 I was honored to be asked to participate in the Meatout 2011 blogging event. On this day, March 20th, 2011, so many people from all over the world are campaigning, handing out samples of vegan food, handing out brochures, spreading the word, and blogging about veganism. We also have kind hearts who are pledging to go veg! Don't worry, we will get to these treats in just a minute! I understand that today I am going to have some first-time readers and visitors. Welcome! The link below has some great past Dirty Vegan posts that introduce myself and my mission, introduce veganism, and some easy tips on how to transition. Also, please feel free to search this blog with the search function, and browse the different labels, archives, and past posts/ yummy recipes. I also invite new readers to interact with me on Facebook and Twitter using the widgets on the right-hand side. This is an exciting time in your life and you will see your whole world (and your health) change for the better, once you adopt a vegetarian lifestyle. Whether it is just for the day, committing to participate in Meatout 2011, a transition phase where you include more veggie meals into your lifestyle, or a permanent decision, you are doing the hugest kindness for animals, the environment, and for yourself. Going vegetarian saves approximately 100 animals live's per year! If you are feeling like this is a lot of information to take in, no worries. The recipes and tips on my blog are easy and laid back. 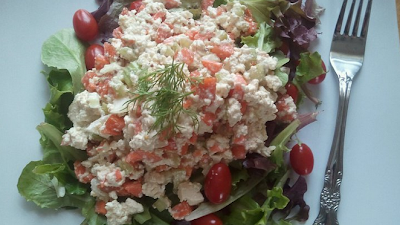 So please subscribe to this blog and you will see tons of simple vegan recipes with ingredients that can be so easily found in most supermarkets (and its not health-food believe me!). There will also be more giveaways, more information, and more fun stuff to come -please see veganism as a place free of stress. And if you think about it, by no longer ingesting the pain, suffering, fear, and death of animals, you are ridding your body and mind of that negativity. For now, lets get Dirty! 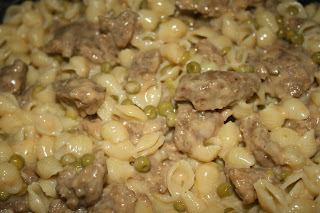 So in honor of this wonderful Meatout 2011 event, I wanted to provide a yummy vegan alternative to a classic treat. And it is EASY!!! That's how I like it, quick, easy, and Dirty! Melt the buttery spread in a large saucepan on medium heat. Then add the vegan marshmallows and melt, stirring frequently. When the mixture is very melty and gooey, remove from heat and add in the cereal. Form mixture into a greased pan using a buttered spoon. Let cool; once cool you can cut them into squares and serve. Enjoy! YUM! So good! Enjoy and thanks for visiting! Bookmark or follow this blog for more Dirty! Strufoli or otherwise known as, Italian Honey Balls, were a tradition in my Italian community growing up. I have made this traditional recipe vegan by replacing a few ingredients like honey with agave nectar, and making this family recipe my own as well. I am happy to share this with you all. It was also very nostalgic to taste these vegan "honey" balls after all these years, and for it to taste so much like what I grew up enjoying as a child. Take the first 5 ingredients, which will be your dry and extract, and mix in a large bowl. Then add in your egg-replacer and melted buttery spread. Mix and knead until doughy. Take some flour from your 1/2 cup reserve to add in (and flour your hands) until the dough is no longer sticky and it is easy to work with. I did this all in my large bowl and used that as my kneading surface. 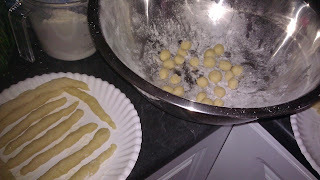 Then take small pieces of the dough and roll into strips like you see in the picture. Then cut off pieces and roll those pieces into small balls. As you see in the photo, I was using floured paper plates to keep my strips on, so that I can place the dough balls in the floured bowl. Then, in a large pot or fryer, carefully heat your fry oil on medium heat. Fry your dough balls until they are golden, then remove with a slotted spoon. Place these balls on a baking sheet lined with paper towel to catch the excess oil. Then heat your agave nectar in a saucepan until it begins to boil. Add balls into the agave and give it a turn, just until balls are covered with it. Then with a slotted spoon, remove and let cool a minute on a baking sheet. 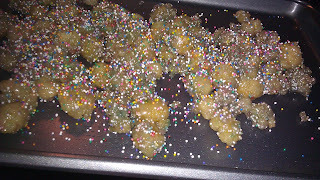 Once slightly cool, sprinkle and toss with round sprinkles. I added my sprinkles too soon and the colors ran a little on my "honey" balls (showcasing the importance of letting them cool slightly). You can eat these fresh or store in a container and enjoy later. Either way, they taste great! Enjoy! Go Green, You Vegan Beauty! 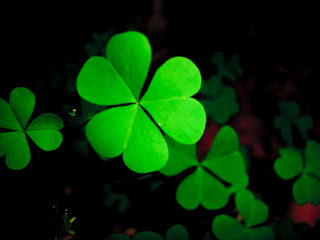 Happy St. Patrick's Day all you Naughty People! Today, some people are turning their beer and food green. That is fun, but I wanted to talk about cosmetics being green! So, as I become aware of more and more vegan friendly beauty products and cosmetics, I am definitely going to talk about them with all of you fabulous people. Recently, I received some products from Tarte to try (thank you, Tarte!). I am falling in love with their cosmetics and I adore how they are conscious of their vegan customers. None of their products are tested on animals, however for the vegan products, they work with PETA to ensure they are truly vegan and even have a vegan section on their website in which you can view all of their vegan products easily on one page. Thank you Tarte for really taking the guesswork out of cruelty-free beauty products. Sometimes it can be tricky, especially for those of you who are just beginning to familiarize yourself with ingredient lists, so I really like when companies accommodate their vegan customers like this. Bravo Tarte, for making glamorous products that are not tested on animals and for providing so many cool vegan options. I really admire companies who are natural focused and conscious of animals and the environment (a lot of their product components are recyclable or post-consumer recycled materials! ), while still being stylish and hip. Also, this is professional quality and natural! You just can't beat that! I really love the way Tarte's natural products feel on my skin, and they look just as nice; bonus! And for now, the Dirty Vegan is signing off. Stay gorgeous! What are some of your favorite vegan beauty products? Also, what's on your St. Patrick's Day food and drink menu today? Three Cheeze "Bacon" Veggie Pita Pizzas & the GIVEAWAY WINNER! Preheat oven to 350 degrees. Spray a large baking sheet with a little non-stick cooking spray. Place the pitas on the sheet. Spread tomato sauce on them. Break up or cup Smart Bacon into small pieces and arrange on the pitas. Then add your vegetable toppings. Now with the mozzarella slices, tear or cut them into chunks and place around on the pizza. Next sprinkle the cheese shreds. Lastly, drizzle olive oil on top of each pizza and bake for about 10 minutes, or until pizzas are melty and slightly brown/ crisp. Enjoy! I really love Lightlife products and have since I first became veg. You can do so much with the Smart Bacon, I love their Gimme Lean products and I cannot even think of having a barbecue or picnic without their Smart Dogs or Tofu Pups. They were kind enough to send me some coupons so I can try out anything I haven't had or make up some cool recipes using Lightlife. I usually use the Smart Bacon for VBLT sandwiches but really loved using it on this pizza. Also, I will be using their Smart Ground in one of my next posts for lasagna, which has been requested by a lot of readers on my Facebook and Twitter pages; stay tuned for that! And for now, the Dirty Vegan is signing off. A Blissful Dessert and a GIVEAWAY! There are so many ways to describe this vegan dessert, but the name says it best...bliss, Coconut Bliss that is! 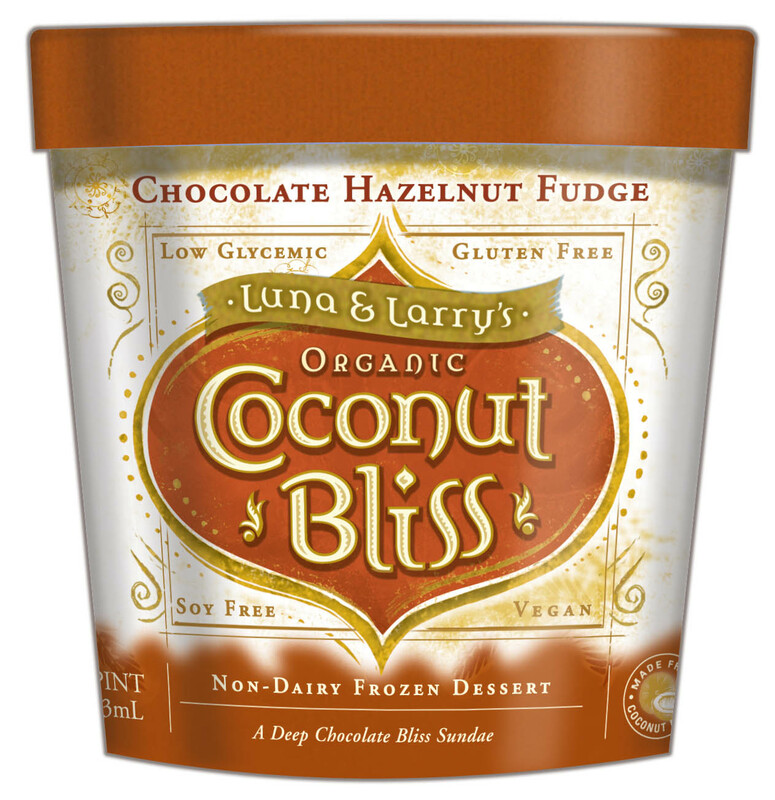 Luna & Larry's Coconut Bliss offers a variety of flavors, some of which include: Cherry Amaretto, Dark Chocolate, Vanilla Island, Naked Coconut (ooooh sounds Dirty), and lots of other great flavors (you can get it in pint size or Bliss Bars!). This delightful dessert can be found at Whole Foods and health food stores. I really am totally hooked on their vegan frozen desserts! Cool, smooth, creamy...oh so enchanting! I happen to love all Coconut Bliss flavors that I have tried, but my favorite is Dark Chocolate. I love the creaminess of the coconut while having the richness of the dark chocolate; its great! I don't have to be the only one having all the fun here. Luna & Larry's Coconut Bliss were cool enough to donate a giveaway prize for one of my lucky readers! Are you excited? I am! 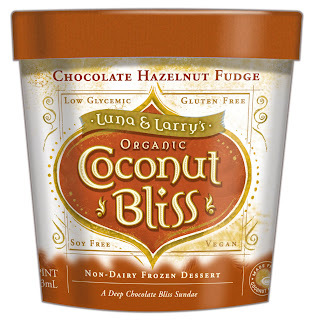 THE PRIZE: One of my lucky readers will receive a Luna & Larry's Coconut Bliss prize pack, which includes: 2 FREE pints of Coconut Bliss in any flavor, a groovy Coconut Bliss sticker, tucked inside a colorful Coconut Bliss comic. DEADLINE TO ENTER: Entries must be received by Monday, March 14th at 9:00 PM EST. WINNER WILL BE CHOSEN AND ANNOUNCED ON TUESDAY, MARCH 15th! *by entering you are agreeing that we can announce your name if you win - Good luck! 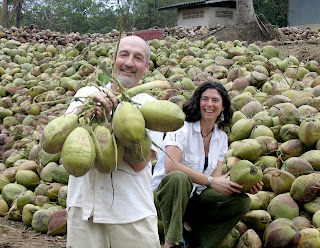 Luna & Larry, a bunch of coconuts. I love it! Preheat toaster or regular oven to 375 degrees. Unroll crescents from can and lay as flat triangles. Cut the mozzarella into 4 strips from each slice. Place a mozzarella strip in the middle of each dough triangle. Then take sprinkles of cheddar shreds and press them into the dough, all over the triangle. Fold in cheese and twist the dough. Bake for about 10 minutes, or until golden brown and no longer doughy. Enjoy with marinara dipping sauce! This recipe is great to make for parties, holidays, quick snacks or after school snacks, to make with your children, or to make in college dorms, to serve with drinks at a cocktail party, for an appetizer or light meal, or for any reason at all. I am a huge fan of responsible consumerism and the accompanying responsible merchants of conscious goods. If you are looking for a clothing store that offers vegan, sustainable, fair trade, and cool fashions...never fear, Ecolissa is here! I received a sweet blogger discount from Ecolissa, and got right to it! As I browsed through everything, I realized fairly quickly that I wanted it all! Everything was very fabulous and at the same time it looked comfortable as well. Their chic clothing and accessories are all eco-and-vegan friendly (using eco-friendly and lots of sustainable materials like bamboo! ), which is good for the environment, and containing no animal products, which is also good for the environment, and importantly for our animals pals. Ecolissa offers options to shop by material (bamboo, hemp, modal/ tencel, organic cotton, reclaimed materials, sorona corn, or soy), by fair trade items, or by products made in the USA. As you can see, even Shirley likes my new Ecolissa duds! ...and she even tried to steal my Infinity Scarf! What do you think of sustainable products? Does that factor in when you are shopping for clothing and accessories? Life is Best Lived Saucy and Cheezy! Boil water and cook pasta for about 10 minutes or until al dente. Heat olive oil on medium high heat and sweat garlic until aromas are released. Brown veggie sausage for a few moments. 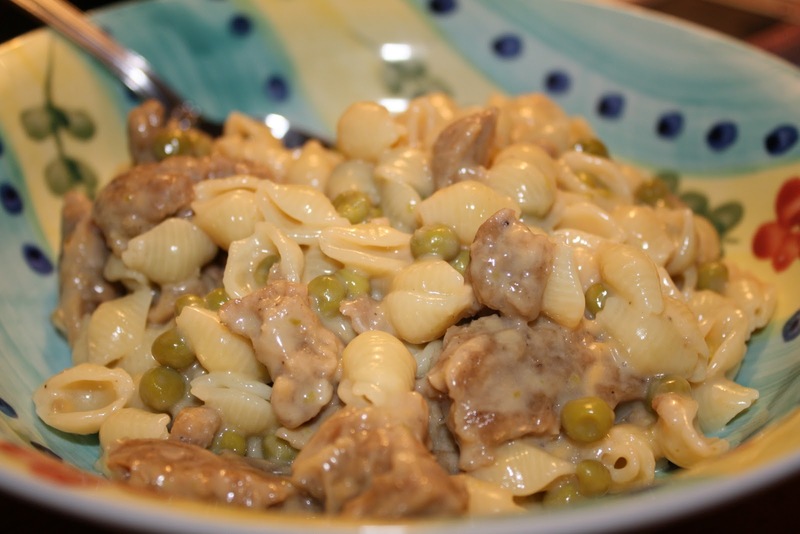 Mix in peas, cream, and buttery spread. Cook for a few moments then melt in "cheese" shreds when just about ready to serve. Mix into your pasta and enjoy! Organic Produce: What's the Real Deal? When it comes to organic produce, sometime it can be pretty pricey...and sometimes not (hello Super Walmart and PriceRite who sell cheap organic produce!). We all have heard the horror stories about harmful pesticides, and the stories are pretty accurate if you think about it. If the levels of pesticides can kill or keep away "pests", what is it doing to our bodies and health over time? 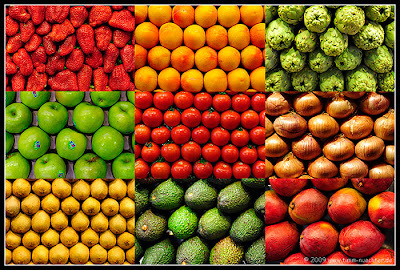 Some fruits and vegetables have protective layers of skin, making it okay for us to buy those particular items non-organic. Some produce skin is eaten with just a quick wash or wipe, and that can be extremely harmful to our health if it is laden with pesticide - especially high amounts. You know some of your anti-organic friends have said things to you like, "organic is just a scam", or "years ago there was no such thing as organic and everyone was fine". Well if you feel the need to buy everything organic, maybe one would feel like its a scam if its not completely necessary to do so. 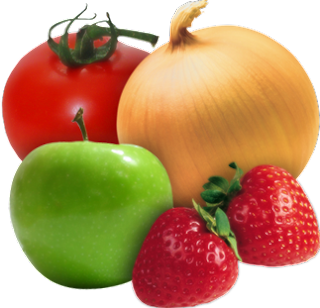 Some produce is completely fine to be eaten non-organic since the pesticide is not likely to penetrate into the fruit you finally ingest. And years ago there was no "organic and non-organic" thinking, but back then farmers took the loss of their crops being partially destroyed. In the money-fueled day and age we now live in, the pesticides are thought of as necessity to them, in order to prevent taking a financial hit to their livelihood. But don't forget, a lot of local produce is actually organic, but farmers do not take the time or spend the money to become Certified Organic; it is hard to do, has lots of strict perimeters and guidelines, and is costly for them to do. So be sure to ask farmers at your local farmers markets or local produce stands. They may very well be pesticide-free, so just ask them. It is always better to buy local produce anyways. For the safeness of it potentially not containing harmful chemicals, and also it being local you are supporting local business, and finally, the produce has not traveled great lengths so it is fresh and in season! Yum! So there you have it folks. Please always wash your produce and think in terms of safety and health. I know people may think it is "over-thinking" it, but the chemicals used these days, due to cost effectiveness, are scary. There are natural pesticides available, produce and certain plants that naturally keep away unwanted visitors, but how many companies use them? 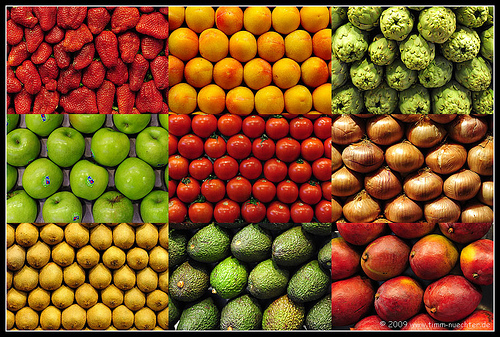 Do you buy all organic, just some, or are your purchases based on price alone? What do you think?